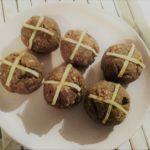 Our scrumptious spicy little Hot Cross Buns are gluten free and low in sugar. 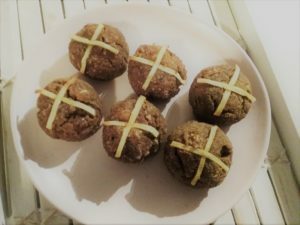 A perfect little snack to enjoy over the Easter period. In a large bowl, mix the dry ingredients – almond meal, coconut flour, sugar, mixed spice, cinnamon and baking powder. Peel apples and set aside 1/2 an apple to use for cross decoration. Grate remaining 2 & 1/2 apples. Cut remaining 1/2 apple into thin sticks to use for decoration over the mini bun. Melt the butter, cool slightly and add to the dry mix. Stir through. Add sultanas, orange zest and grated apple and mix well. Mix will now form a slightly sticky dough. Roll small balls (about a golf ball size) of the mix and place into the muffin cases. 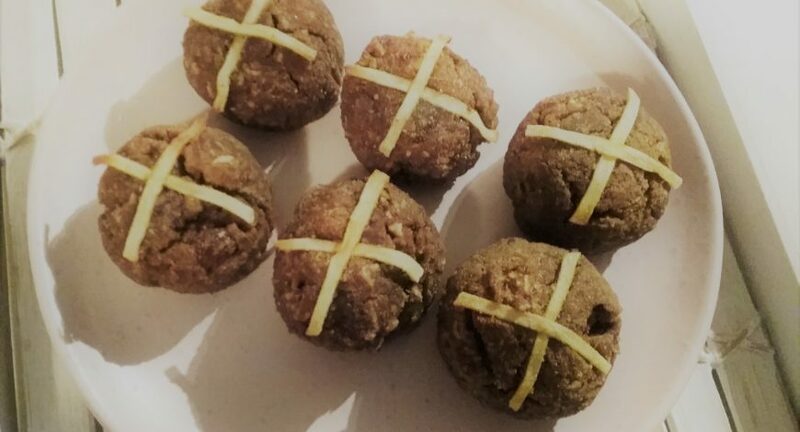 Place crosses made from the apple sticks over the top of each bun. Glaze if you wish – as per note below. We did glaze these with a quick mix of raw organic honey, boiling water and a the juice of half an orange. Serve warm with a little melted butter.